EMI test 3915, 4.0 mm aluminium sphere, 7.2 km/s, 45 degrees 1.2 mm Al7075 bumper 49.5 mm spacing 3.3 Al7075 backwall After the development and validation phases for the Columbus Module and ATV Shields, the attention has been focused on survivability of unmanned spacecraft to space debris impacts. The approach is to characterize the impact conditions which can impair the performances of various subsystems or equipment. Electronic boxes, Harness, Piping, Pressure Vessels are among the studied items. 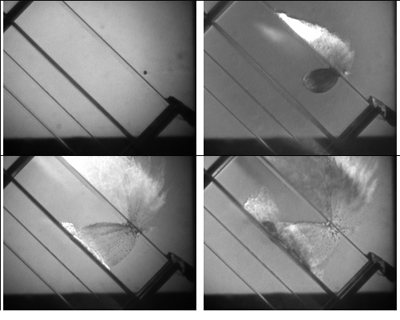 In order to cause temporary or permanent failure of the e-box function, projectile diameters ranged from 2.3 mm to 5 mm, depending on the stand-off to the Al H/C SP structure wall (0 mm and 300 mm, respectively). These values have to be compared to the typical 1 mm projectile diameter required to perforate the external wall of a typical spacecraft. Copyright 2000 - 2013 © European Space Agency. All rights reserved.